TWO new aged care homes with a combined capacity of more than 260 are coming to Mandurah. Canning MHR Canning Andrew Hastie said the commitment to Mandurah represented an investment of more than $17.5 million per year. The announcement comes as part of the biggest expansion of residential aged care in Australian history, with $967 million being committed by the Federal Government. 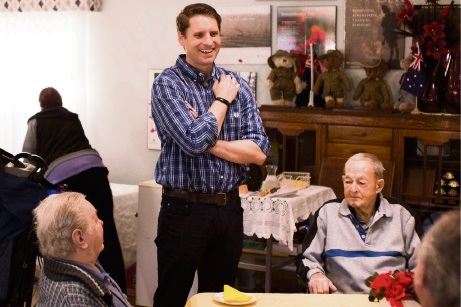 Mr Hastie said the new places would provide a welcome and much-needed boost to aged care services in the Peel Region. “This is historic investment for our region – over $17.5 million every year to deliver 264 local residential aged care places for people in Mandurah,” he said. “The need for more aged care facilities was an issue that regularly popped up during my 2017 town hall meetings. “A lot of people would tell me that they grew up in this area, retired in this area and wanted to spend the rest of their life here. “The problem was Mandurah just didn’t have the capacity to cater for them. Mr Hastie said options for people in the local community would make the move much smoother and they would be less anxious around the transition. In Mandurah, the Federal Government is partnering with aged care service providers Signature Care and Opal Aged Care. The providers will build two new aged care facilities and the ongoing cost of servicing residents will be met by the Government. Opal Aged Care’s facility will provide an additional 120 places on Leisure Way in Halls Head. When complete the site will include a combination of single rooms and companion rooms, all with ensuites. The home will also meet the needs of those requiring high care, dementia specific care and feature communal spaces including caf, hairdresser, consulting suite, dining, lounge and audio rooms. There will an 18-place dementia specific care area with a supportive lifestyle program. Twenty places will be prioritised for people with limited financial means. Opal Halls Head will also offer 2190 respite days annually to support older members of the community who live in proximity to the home. Dawesville Aged Care, to be built by Signature Care, will provide 144 residential places on Bailey Road in Dawesville. The home will offer accommodation catering for all needs including dementia specific services and respite services. The 144 places will be configured as single rooms divided into two wings of 36 places and four dementia specific units of 18 beds each. This will include dedicated capacity for financially disadvantaged residents. Each room will have its own ensuite and an external patio area. Some rooms will include a connecting door to cater for couples. The home will have large dining rooms, lounge rooms, and dayrooms and other recreational areas throughout the home including a community hub and caf. There will be a wellness centre, a chapel, meeting rooms, formal dining rooms, hairdresser, doctors consulting room, activity rooms, men’s shed, cooking display, craft rooms and internet and library areas. External areas will be landscaped, have covered entertaining areas and will be secure.